Last month, we told you about the arrest of Feisal Ali, who was featured on Interpol’s Infra Terra, a list of people wanted for environmental crimes. Now, authorities have arrested another man on the list — Rajkumar Praja, an alleged member of a rhino poaching operation. LYON, France – Nepal’s most wanted wildlife criminal and the subject of an Interpol Red Notice, has been arrested in Malaysia, according to Interpol officials. Information exchanged between the Interpol National Central Bureaus in Nepal and Malaysia on the case and Praja’s possible whereabouts eventually resulted in his arrest by the Royal Malaysian Police in January 2015, where he was found in possession of a fraudulent passport issued under a false name. He has since been returned to Nepal. Praja was a target of Interpol’s Operation Infra Terra in 2014. As Interpol’s first global fugitive operation focused on criminals wanted for environmental crimes, Infra Terra targeted 139 fugitives wanted by 36 member countries for illegal fishing, wildlife trafficking, illegal trade and disposal of waste, illegal logging and trading in illicit ivory and more. Other high-profile targets of Operation Infra Terra who have been arrested as a result of the global operation include suspected illegal ivory trader Ben Simasiku, and Feisal Mohamed Ali, the alleged leader of an ivory smuggling ring. Rangers at Great Smoky Mountains National Park seized 870 ginseng roots and caught three poachers during an investigation in July. According to the National Park Service’s Morning Report, the rangers caught the suspects red handed (actually, their hands and clothes were dirty from crawling around) after two hour of surveillance. Authorities also noticed digging tools in their car and found sacks with the ginseng roots, which totalled 5 pounds. At this year’s rate of $850 to $1,000 per pound of wild ginseng root, the lowball estimate on the seizure would be $4,250. A week earlier, the same rangers recovered 28 roots after spotting two men with a digging tool in the park. Over the past year, Smoky Mountains National Park rangers seized 2,345 illegally harvested ginseng roots from the North Carolina and Tennessee sides of the park and arrested 26 people. 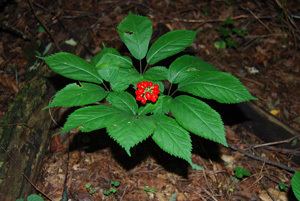 American ginseng with berries. Photo courtesy U.S. Fish and Wildlife Service. Ginseng can be found in sports drinks in supermarket coolers and pills on health food shelves. Called “zang” in some circles, American ginseng grows wild in much of the eastern United States, but most of it is sold to Asia where it goes for top dollar as folk medicine. To keep from wiping out the plant, ginseng is protected under the Convention on International Trade in Endangered Species, and conservation officials limit when it can be picked and dictate how old specimens have to be before they are dug up. But a spike in ginseng prices had brought poachers into the woods. These illegal harvesters forego permits, dig out of season, trespass on private property or sneak into parks, where harvesting is prohibited. ASHEVILLE, N.C. – Billy Joe Hurley, 46, of Bryson City, N.C. was sentenced to five months and 15 days in jail for the illegal possession or harvesting of American ginseng from the Great Smoky Mountains National Park. According to information from sentencing hearing and documents, on June 28, 2014, Hurley admitted to illegally possessing 83 American ginseng roots he had illegally dug from areas in the Great Smoky Mountains National Park. Hurley pleaded guilty to the poaching charge, which marked his fourth such conviction. Staff of the National Park Service replanted the recovered viable roots but estimate that at best, 50% of the replanted roots are likely to survive. At the sentencing hearing, a National Park Service botanist testified that the American ginseng species is under severe pressure from poachers in the Great Smoky Mountains National Park and may not be sustainable if it continues to be harvested illegally. During the hearing, a special agent with of the U.S. Fish and Wildlife Service also testified that financial gain is likely to continue to drive poachers and that fresh ginseng can bring up to $200 per pound on the black market. Park service officials have announced an investigation into burl poaching at Redwood parks after officials matched hacked scars on trees with burls featured at a nearby shop. National Park Service and California State Parks Law Enforcement Park Rangers and Investigators working cooperatively have concluded a year-long investigation leading to the arrest and charges of felony Grand Theft, Vandalism and Receiving Stolen Property against Danny E. Garcia of Orick, Calif., for the poaching of old growth redwood burls from the park. Charges are pending against another individual who is currently serving time for unassociated charges. On April 19, 2013, a researcher in the park discovered cuts on an old growth redwood tree within Redwood National and State Parks in the Redwood Creek drainage. Park rangers responded and discovered a 10-foot diameter, old-growth redwood tree that had been badly damaged by the removal of several large burls. The burls cut from the tree were massive, the largest cut measuring approximately 8.3 feet at the base, 8.2 feet in height, and 1.7 feet deep (approximately 115 cubic feet). An anonymous tip led to the discovery of the burls at a local shop. Park Rangers matched the size and shape of the cut burls in the shop with those taken from the old-growth redwood tree at the poaching site. Investigation by NPS Law Enforcement Rangers indicated that Garcia had been in possession of the burls taken from the site, and then sold them to the shop in Del Norte County. The burl shop is not currently under investigation in this matter. Yellowstone National Park is asking for the public’s help in identifying who was responsible for illegally retrieving a bull elk carcass from inside the park last month. Park rangers determined the bull was shot sometime between Sept. 11 and Sept. 21, inside the park’s southern boundary behind the Wyoming Fish and Game patrol cabin along Thorofare Creek. Anyone with information is requested to contact the Lake Ranger station at 307-344-2403, or call the Tip Line at 307-344-2132. In some cases a cash reward is offered for information leading to the arrest and conviction of anyone illegally using firearms in the park or illegally killing or transporting wildlife in the park. Hunters are reminded that hunting is not permitted within the park. Though most of the park boundary is well marked, it is the responsibility of the hunter to ensure he or she does not hunt within the park. The Lacey Act and the Code of Federal Regulations strictly prohibit the killing or removal of any animal from inside Yellowstone. This includes animals shot legally outside the park that cross into and die within the park boundary. Taking and removing any animal parts, including shed antlers, is also prohibited. Violators are investigated and aggressively prosecuted, and are subject to penalties including fines, restitution, and the forfeiture of vehicles, equipment and personal property associated with the violations.